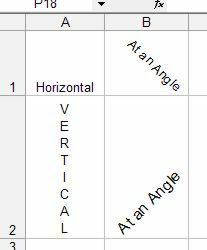 Learn step-by-step how to change the vertical and horizontal alignment of your Microsoft Office Excel worksheet cells. Also learn how to change the text direction of cell content. Normally, the contents of a cell are displayed horizontally. How traditional! In some cases, you may want to display the text vertically or at an angle for special effect, or to make it hard for your boss to figure out just where you messed up on last year's sales records. 1. Select the cell or range to modify. 2. Choose Format ► Cells from the menu bar, OR press CTRL + 1. 3. Click the Alignment tab in the Format Cells dialog box. 4. Select one of the options in the Orientation section. Adjust the angle by dragging the gauge or specifying an angle (in degrees). 5. Click OK to apply the formatting to the selection. 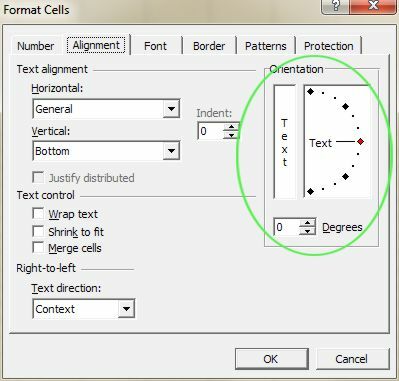 Excel enables you to indent text in a cell. Using this feature is much easier than padding the cell with spaces to indent. Remember that	Indented text is always left-aligned. 1. 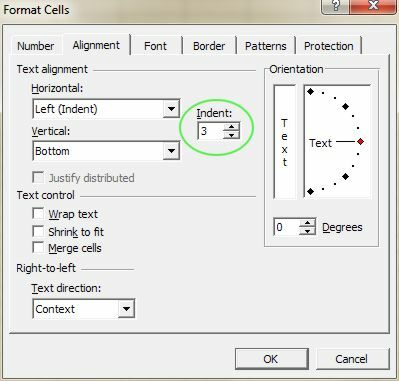 Select the cell or range of cells to indent. 2. Click the Increase Indent button on the Formatting toolbar to move the cell content to the right. Click the Decrease Indent button on the Formatting toolbar to move the cell content to the left. OR Choose Format ► Cells from the menu bar, OR press Ctrl+1. 4. Specify the number of spaces to indent in the Indent text box. Return to Excel XP from Microsoft Office Excel | Alignment"